Today dear friend I have information you will rarely read elsewhere. 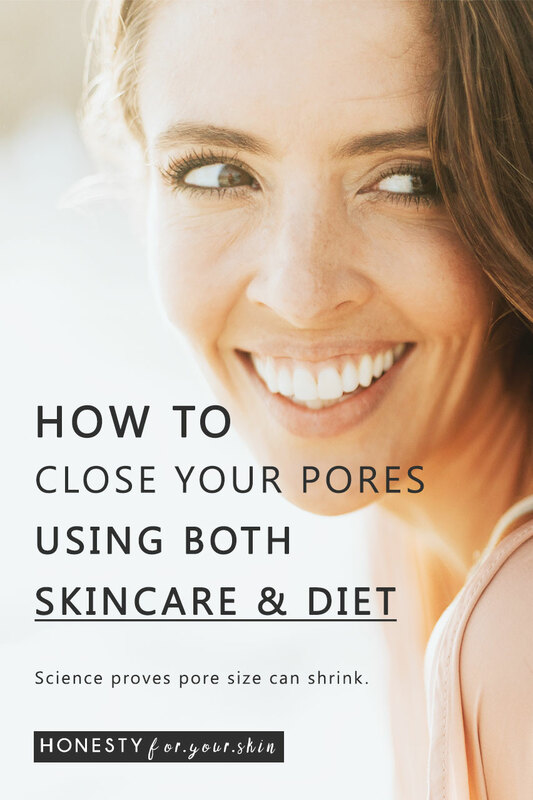 Tips on how to close pores which have scientific standing aka these tips have published, scientifically relevant papers saying yes – this can work, yes pores can close, yes it’s possible to shrink your pores. Which is 1000% crazy because visit pretty much anywhere else on the internet and you will read: Pores cannot be shrunk, pores can only be minimised. Aka you can only ever make pores look smaller – like clever cover-up or a hip balancing fishtail dress. Newsflash: you can shrink your pore size. But word of warning: Your pore size will not shrink overnight. The 2 how to close pores tips I’m about to share with you require commitment. One is a home remedy. The other is a specific active ingredient you must find in skincare. To understand how to close pores you first need to understand what makes pores big. You need to get inside your skin’s pore making recipe and remove a key ingredient. Like taking yeast out of your bread mix. No yeast, no rise. No X, pores shrink. Inside every pore you have there’s a hair follicle and a sebum gland aka a gland which can pump out oil. Imagine your pore like a suitcase. When there’s a normal amount in your suitcase it’s flat. When there’s 10 pairs of shoes, 5 coats, strappy tops, bikinis and jumpers (just in case it snows or suns – it can only happen in Canada ‘eh) your suitcase bulges. The more you put in, the bigger it gets. And the more you use it like this, the saggier your suitcase fabric becomes and the easier it is for you to stick more stuff in and make it bulge bigger. Can you see what’s been happening to your pores? Good news is, do something now and you can help shrink pores back. …don’t just take my word for it dear skin savvy – published study data is proving it. Published study data shows do this and your pore size will get bigger, don’t do this or do this instead and your skin will get less oily aka your pore size will shrink. Every clinical factor which can make your pore size bigger can also help you close pores. Do the opposite thing to what’s making each clinical factor happen and you take the yeast out of your pore size equation. Aka you make a change which will make your skin less oily. Aka you start using skincare which can increase the elasticity of your pores. Aka you do something which has the knock on impact of making your hair follicles smaller. Sebum glands can be stimulated aka turned up by diet. That when you eat sugar, high glycemic index foods/insulinotropic foods – hormones get released. That when a hormone called insulin-like-growth-factor or IGF-1 for short is in high concentration a person’s skin becomes more oily and pore size gets bigger. Your diet has huge impact on your skin. People realise it less because diet is cumulative. Plus not all bad for skin foods are obvious – some look healthy. Eaten a healthy breakfast and lunch but gone crazy wild on white pasta plus dessert for dinner? Or replaced your go-to chocolate bars with sugar high fruits? Or added in 1 new and trending health food but not got rid of standout every day offenders? I’m holding my hand up right there with you my friend. Diet can be a minefield. The changes diet can make to your pore size plus oiliness of your skin is significant – but you have to commit to get there. Hundreds of studies are linking high glycemic index foods and diets with increased sebum production, large pore size and acne. You eat a diet full of yummy foods with low glycemic index. You avoid insulinotropic foods i.e. foods which don’t have a high glycemic index but which still cause lots of insulin hormones to be released. You commit to these changes for 90% of what you eat. Want to get a kick-start aka have someone tell you what to eat, when to eat it and how to make it? Grab a copy of Your 2 Week Clear Skin Meal Plan here. A how to close pores tip from the outside-in. How crazy is this – your skin is a vital organ. If you don’t have skin – you can’t live. And on the flip side skin’s also the only vital organ you have direct access to i.e you can rub a cream in and that cream can act on your skin’s biology. How that cream acts on your skin’s biology is 100% dependant on what’s in the cream you’re using. And if you want a cream which can help shrink pores – you want to be using a cream with superstar skincare ingredient vitamin A aka retinol. Here’s what we know: clinically available retinoids like tazarotene and tretinoin are studied to reduce facial pore size. Warning: Retinoids can cause skin to become dry. It’s a known side effect. Which guess what – is extremely likely to be because retinoids reduce sebaceous gland size, decrease proliferation of basal sebocytes, suppress sebum production by up to 90%, inhibit sebaceous lipid synthesis and prohibit the progression of sebocyte differentiation. Phew – what a mouthful ‘eh. Bottom line: Retinoids do everything which will make your skin release less sebum aka they do everything which can help lead to shrinking of your pores. They really do – because not only can retinoids decrease sebum production, they can also increase your skin’s elasticity. Remember – take away a trigger of large pore size and large pores struggle to happen – aka without yeast your bread’s struggling to rise. How long do retinoids take to work? You will need to be using a retinoid for many months before you see significant impact on your pore size. Studies testing retinoids have shown a reduction in pore size after 12 weeks of everyday use. A reduction which will continue to get better, the longer you use it. Also know this – when you stop using a retinoid, some benefits can reverse i.e. an increase in your skin’s elasticity. If you’re serious about how to close pores you will need to commit to both diet and skincare changes – but don’t worry once you get going you won’t even think twice about them. As Nike would say – just do it.